LAS VEGAS – Sept. 6, 2016 – Barrett-Jackson, The World’s Greatest Collector Car Auctions®, will feature a docket of exceptional muscle cars during its 9th Annual Las Vegas Auction from Oct. 13-15, 2016, at the Mandalay Bay Resort and Casino. 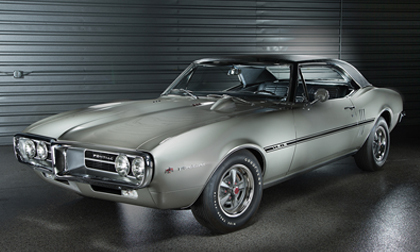 Among the most anticipated of these American muscle cars is a pair of 1967 Firebirds – VIN #001 (preview) and VIN #002 (preview) – that are the first two ever built by Pontiac. Also included in the Las Vegas docket is a wide range of Detroit iron, including a 1969 Ford Boss 429 Fastback (preview) and the rare 1970 Plymouth Superbird (preview) used to perform air-quality tests for the Environmental Protection Agency. The 1967 Pontiac Firebird Convertible #001 (preview) and Firebird Coupe #002 (preview) are the very first production Firebirds ever built and two of the most significant Firebirds ever produced, representing a huge piece of automotive history. The cars, which will be sold as a pair, were used for auto show and advertising purposes before being eventually released and sold. The cars have been together since their production and were carefully restored to their original glory. Impressive Ford Mustangs will also be a part of the Las Vegas docket in October. A 1969 Ford Mustang Boss 429 Fastback (preview) selling at No Reserve is a matching-numbers, all-original car that only has 21,400 original miles. It features a 429ci V8 early-production S-code NASCAR motor with a 4-speed manual transmission and has only been titled to two owners since it was originally sold in 1969. Also selling at No Reserve is a Ford Shelby GT500 Convertible (preview), one of only 231 Acapulco Blue 1968 Shelby GT500 convertibles. It features the original 428 Police Interceptor engine, is equipped with a rare combination of automatic transmission and air conditioning, and has been meticulously restored to its original condition. The 1970 Plymouth Superbird (preview), also known as the “The EPA Bird,” was purchased in 1972 by the Environmental Protection Agency to perform air-quality tests while chasing commercial jets down runways. Nichels Engineering was commissioned to perform the tests and install special testing equipment inside the car to monitor air pollution, noise and tire dust being omitted. It was used by the EPA for close to one-and-a-half years before being placed in a government surplus area and later sold. Equipped with a 440ci V8 engine and manual transmission, “The EPA Bird” underwent an extensive three-and-a-half year restoration back to its original Nichels specs. For more information on becoming a bidder for Barrett-Jackson’s 9th Annual Las Vegas Auction at Mandalay Bay Resort & Casino, follow the link to http://www.Barrett-Jackson.com/Bidder/Home. Absentee bidding options are also available and powered by Proxibid. Established in 1971 and headquartered in Scottsdale, Arizona, Barrett-Jackson, The World’s Greatest Collector Car Auctions®, is the leader in collector car auctions and automotive lifestyle events. The company produces auctions in Scottsdale, Arizona; Palm Beach, Florida; at Mohegan Sun in Connecticut, and Las Vegas, Nevada. With broadcast partners Velocity and Discovery Channel, Barrett-Jackson will feature live television coverage in 2016, including broadcasts in over 100 countries internationally. Barrett-Jackson also endorses a one-of-a-kind collector car insurance for collector vehicles and other valued belongings. For more information about Barrett-Jackson, visit http://www.barrett-jackson.com, or call 480-421-6694.